The Fortnightly Club Records Collection consists of records created by the club since it was founded in 1913 as a literary club for women in the Roanoke Valley. Materials include yearbooks, meeting minutes, program materials, scrapbooks, correspondence, news clippings, photographs, and other material generated throughout the clubs existence. 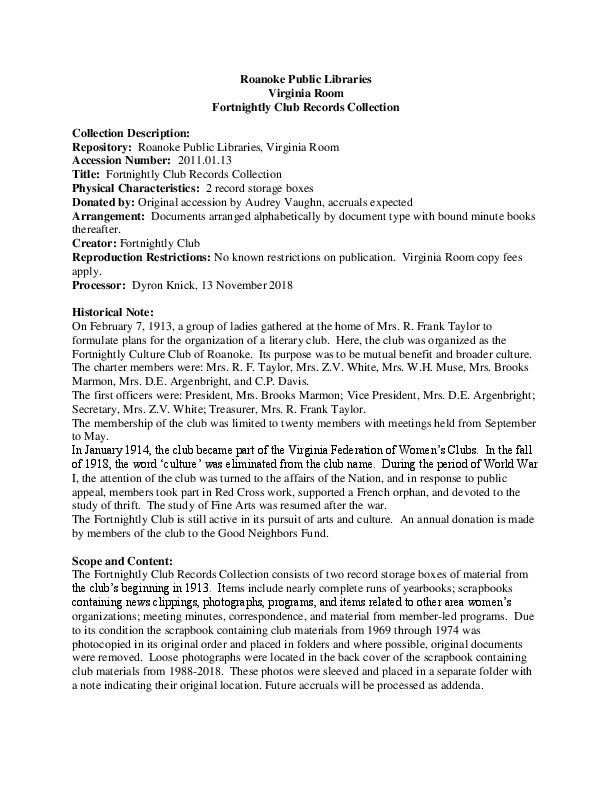 Roanoke Public Libraries, “A Guide to the Fortnightly Club Records Collection,” Virginia Room Digital Collection, accessed April 19, 2019, http://www.virginiaroom.org/digital/document/FortnightlyClubRecords.